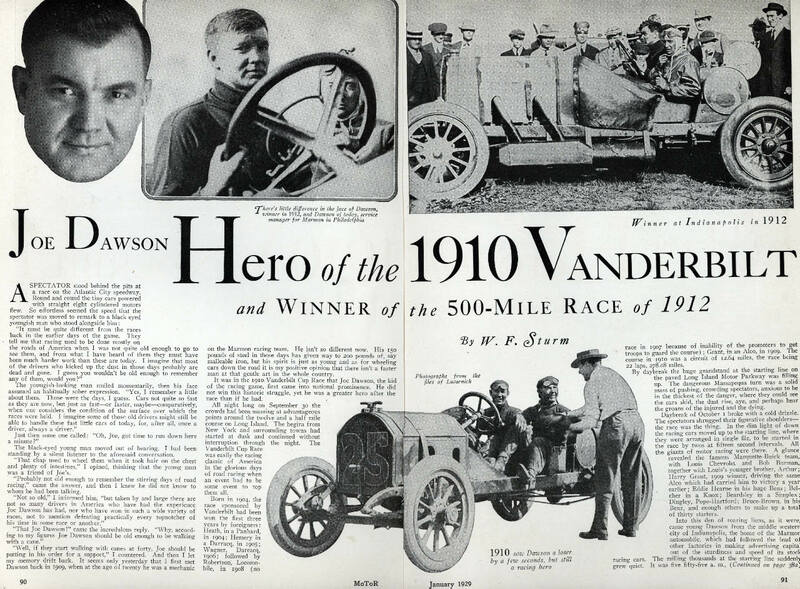 Born in 1889 in Odon, Indiana, Joe Dawson competed in the the 1910 Vanderbilt Cup Race and three Indy 500 Races (1911, 1912 and 1914). 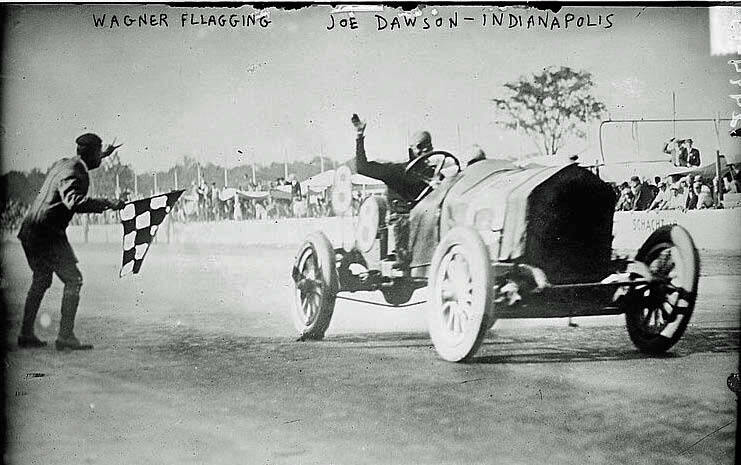 Joe Dawson finished second in the 1910 Vanderbilt Cup Race losing by only 25 seconds and won the 1912 Indy 500 Race. He was considered the hero of the 1910 Vanderbilt Cup Race for stopping to check on the condition of an injured spectator during the race. 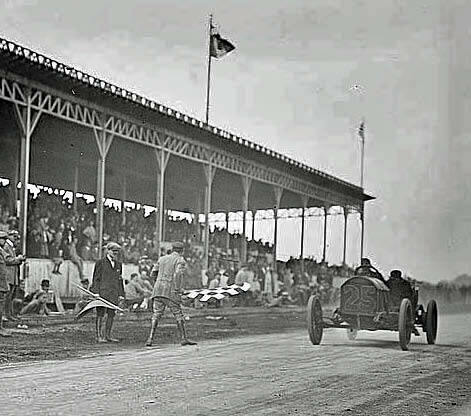 Known as "The Indiana Whirlwind", Dawson driving the #25 Marmon led by more than four minutes on Harry Grant's Alco Black Beast by lap 17 of the 22 lap race. But the poor judgment of a spectator who was hit by Dawson on the backstretch during the next lap determined the outcome of the race. Dawson stopped to check on the man, who suffered two broken legs, and then had to pit to repair his gas line. He spent the remaining four laps steadily gaining on Grant only to come up 25 seconds short. 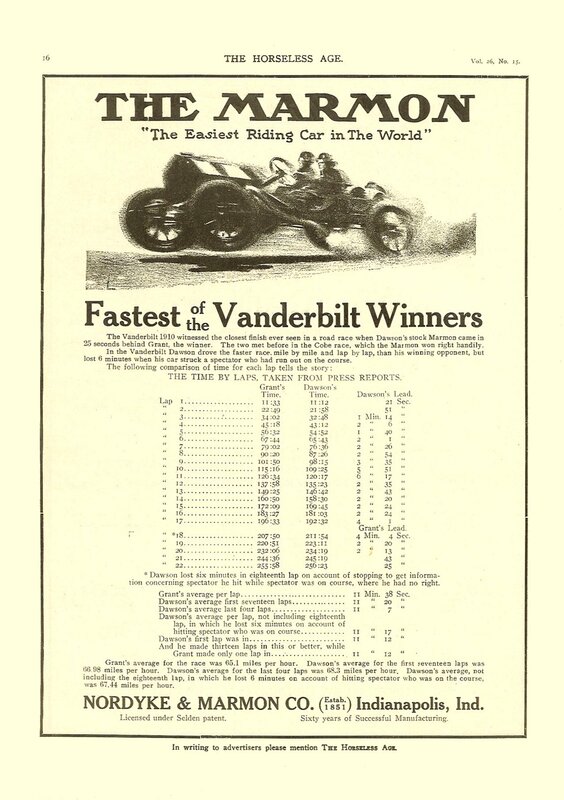 1911 Marmon ad comparing the performance of the #25 Marmon with the winner #18 Alco. Submitted by Jean-Yves Lassaux. For the second running of the Indy 500 Race, Joe Dawson drove a stripped down version of a National passenger car. 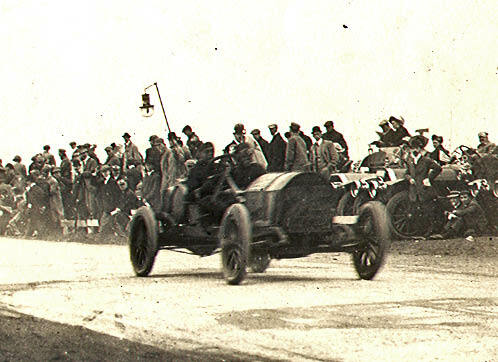 On loan from Nordyke & Marmon, Dawson led only the final two laps, winning first place over the Mercedes of Ralph DePalma which broke down within sight of the finish. The National's four-cylinder engine displaced a hefty 491 cubic inches, making it the largest ever to win. 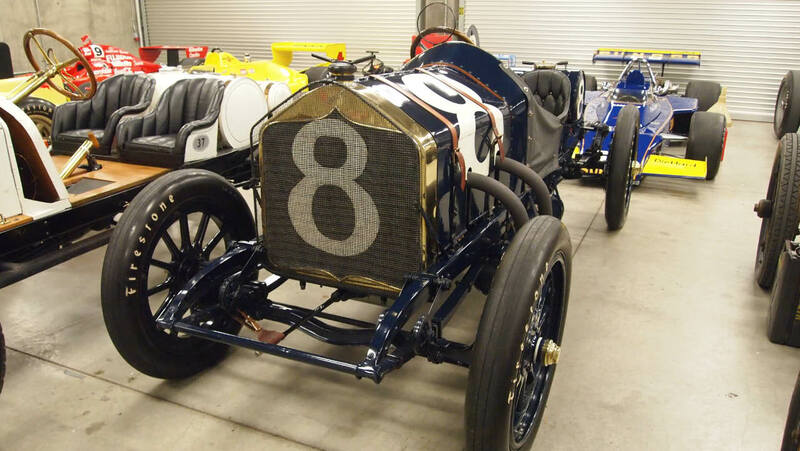 Joe Dawson, the meteoric youth who capture the 1912 five hundred-mile race in the record time of 78.7 miles per hour, has had a racing career second to none. Starting as a Marmon tester, he plunged to the front in daredevil fashion, always speeding as fast as his machine would go. Despite his tendency to "step on it," however, Dawson has always displayed the coolest of judgment under fire. A better judge of pace and position never lived. Knowing to a fraction of a second what is mount is capable of, he invariably drives it to the limit of safety and holds it there. If he fails to win, it is usually due to some other reason than lack of personal ability. Nor is the headliness his only virtue, his heart being as big and generous as himself. In one of the earlier Vanderbilts he thus sacrificed first place for the sole reason that he stopped to inquire what had become of a spectator he had hit. The only support of a widowed mother, he presents an ideal spectacle of filia duty and devotion. Never does he enter a contest that maternal prayers are not breathed in his behalf. To this, perhaps a big share of his success is due. 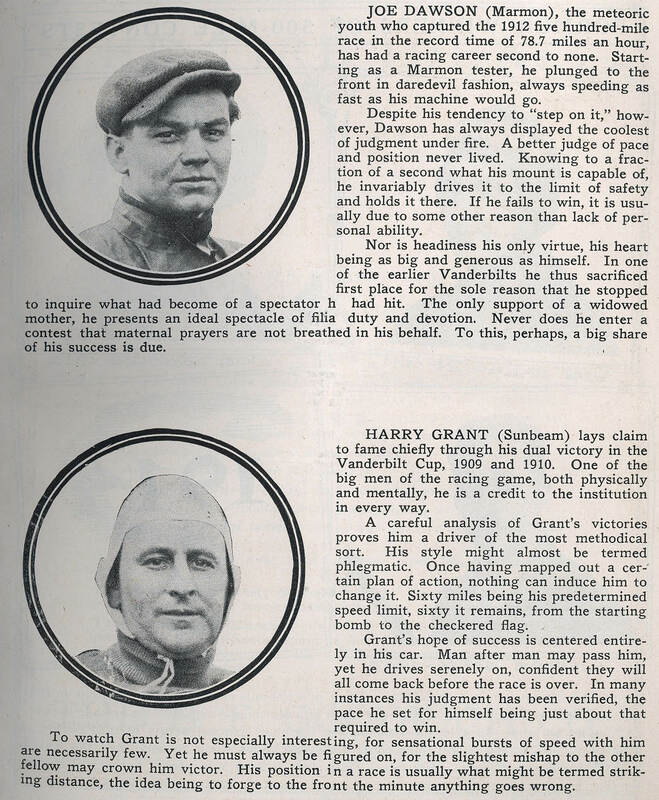 Motor January 1929 "Joe Dawson "Hero of the 1910 Vanderbilt Cup Race"
Dawson’s Marmon during the 1910 Vanderbilt Cup. I have added the ad above. 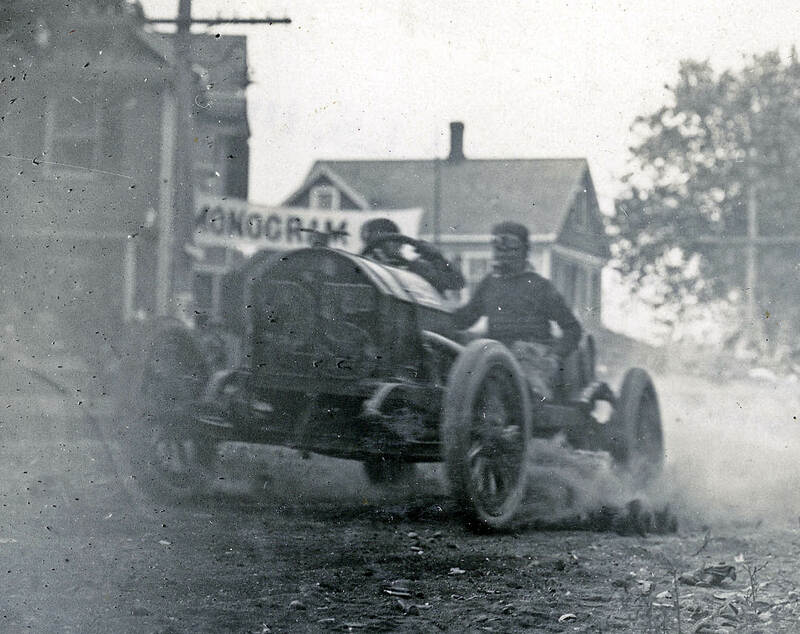 Louis Chevrolet led the 1910 Vanderbilt Cup race until he crashed with suspension failure in his Marquette Buick. He would have easily won the race with better suspension. Instead he ended up in a Long Island hospital.